Good Morning everyone! I have good news again - in spite of not doing my Blogger's Challenges for the last, um, 3 weeks - I haven't been kicked off the team! Hooray! This week we were to take a layout or sketch and us it two different ways. Well, I hadn't posted this conch shell card yet for you to see and since I just LOVE it (and this stamp set, Seaside) I HAD to share! So, I just turned the layout on it's side for my second card - which uses ALL NEW In-Colors, Designer Series Paper and two NEW Stamp Sets that I brought home from Convention! The first card some of you may have seen since we created it at Stamp Camp last month, but for those of you who haven't here are the specs. 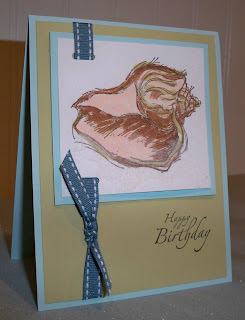 I used the retiring Soft Sky and River Rock cardstock along with Naturals Ivory and simply stamped the conch shell image from Seaside in Basic Brown. I then watercolored the image using reinkers in Close to Cocoa, River Rock and Blush Blossom with my favorite coloring tool, the Aqua-Painter. 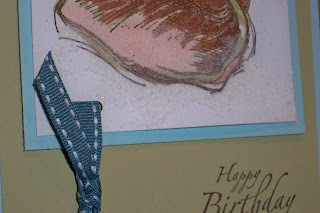 The image was layered onto Soft Sky cardstock and then I used the Horizontal Slot Punch to punch slits in the layers for the Blue Bayou Stitched Ribbon to slide through. It was then popped up on dimensionals and adhered to the River Rock layer with the ribbon wrapped around and adhered to the back. The close up picture is hopefully highlighting where I took a foam brush and lightly brushed on Crystal Effects and then sprinkled neutral colored sand from the craft store. It's supposed to look like it just washed up on the beach! The last thing I did was to stamp the sentiment from It's Your Birthday which is retiring! I have to say, that there is a new birthday sentiment set in the new catalog, BUT, this one is still my favorite - I just like it better for the variety of sentiments and font styles. Don't forget, it's 20% off thru this Sunday if you take advantage of my Aloha Sale! Now, for the second card, I just turned the layout onto it's side and pulled out some FUN, NEW toys! 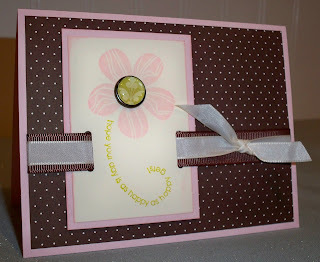 The card base is Pink Pirouette cardstock, layered with some Chocolate Chip swiss dot paper from the Bella Rose Designer Series Paper. I stamped the focal image in Pink Pirouette onto Very Vanilla cardstock and inked the edges of this piece as well with Pink Pirouette. Oh, wait, is that a NEW stamp you see?!! The bloom is from Eastern Blooms and was a gift to all of us who went to convention! And the cute stem saying is actually a butterfly trail from the NEW Flight of the Butterfly stamp set which we also received as a gift! It says "Hope your day is as happy as happy gets." and I stamped it in Kiwi Kiss ink. The flower center is one of my fav Build-A-Brads and I used a piece of the Bella Rose Designer Series Paper for the color. Again, the horizontal slot punch was used to create the ribbon slots and I layered Chocolate Chip Wide Grosgrain and Very Vanilla Taffeta to finish it off. I have to admit, that I sat down this morning without a clue what I was going to create for today's challenge and I really love how this came together - in about 1/2 hour! Yippee! I just love it when all my gears are clicking! It doens't happen all to often so I have to celebrate when it does! Beautiful Robin! Was great to see you again in SLC - your presentation rocked! Welcome back, Robin. Sometimes life just gets in the way of our play time, but that's ok...you're back now. What great cards. I really like the way your ribbon runs through the images and the wonderful color schemes. Great job! Good to see you back Robin! I'm thinking that Eastern Blooms set is going to be on my purchase list right away. Love the colors you used with your 2nd card. That shell card is stunning! Also love what you did with the Eastern Blooms! Loved getting to chat it up with you at convention! Blessed am I to know you! Great cards. Love the colors on the shell one. Oooohhh! You are so smart. I am SO stealing the idea of the butterfly trail as a stem. Love your cards!! It was SO much fun finally meeting you in person at SLC. It was so nice to meet you in person last week in Riverton. These are both so pretty! I love how you did the ribbon on these and how you combined two of the new stamp sets on the second card. Love the flower card Robin, what a great week to come back to BC and the cards you have done are perfect. Both cards are wonderful. I really like a sketch that can be flipped and still work! Both cards are beautiful, but I love that flower with the brad center and the stem...perfect! Hope you are having a wonderful vacation! Welcome back!